Challenges 30 acres of land with inconsistent soils precluding a conventional subdivision. Significant access issues. Solutions JS Barry spent considerable up-front soft cost money and more than two years to secure necessary permits to construct the first PRDS (Planned Residential Development for Seniors) in the town of Kingston. Advised zoning bylaw committee in its writing and adoption of the PRDS article. Negotiated for six months the acquisition of abutting 25 acres of land fulfilling PRDS bylaw frontage requirement. Abutting acres of scenic cranberry bogs and open space was subsequently deeded to the town Conservation Commission. Results Property owners who had paid their fair share of taxes for more than 45 years (and who still reside o a portion of the site) were able to secure their retirement through the sale of their land. 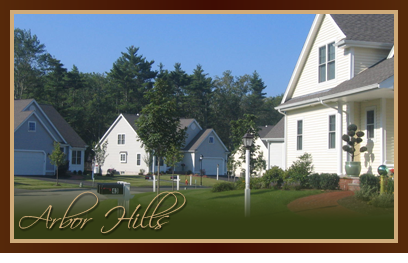 The PRDS of 57 homes has been largely successful providing much needed senior housing and tax revenues for the town. Twenty-five acres of open space is now a protected wildlife habitat and park with walking trails throughout for the enjoyment of town residents.